If your young (girl) reader is a fan of ‘fractured fairy tales,’ this children’s book offers a wonderful comical version of the classic Princess and the Pea. This book is playful from start to finish, and offers a nice break from anything serious. There’s not a serious ‘bone in the body’ of this lightweight children’s book, which is just fine. At first, I asked myself if this children’s book represents good literature. But when I finished the book, I felt that the answer was yes, if we understand literature to include the ability to weave a good story together, write with humor, and add enough drama to make us stay engaged. One would expect in the beginning there’s no drama at all – of course the prince and the girl will marry. Yet nothing in the telling of the story really makes that a sure thing. So we read on just to enjoy the surprise in the end, which of course is not so surprising. A lightweight, easy-to-read children’s book, one that’s good for encouraging young readers, most likely girls, ages 8 and up. 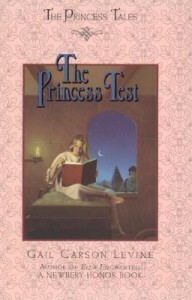 This is a fun and enjoyable fairy tale by the author of Ella Enchanted, which is a more substantial, but in some ways equally humorous book.